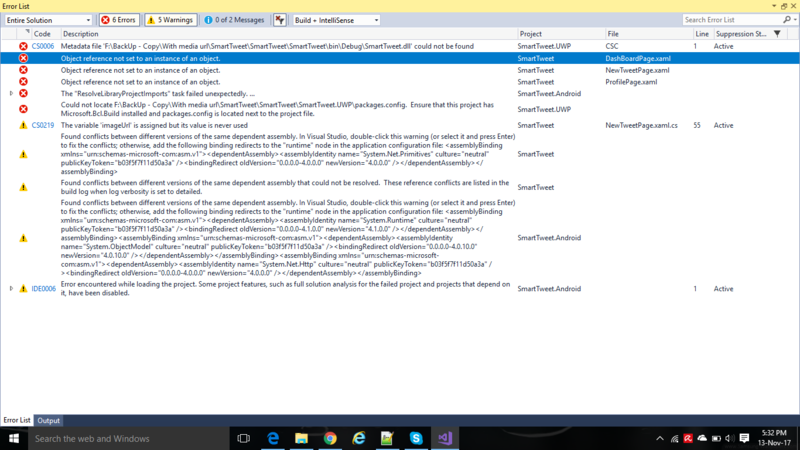 I am new to xamarin. My project is working fine, but suddenly getting an error without any action: "Object reference not set to an instance of an object"
I search about this issue, but couldn't get a solution. I am stuck with this issue, anybody please suggest a solution. This issue happens because of nuget package version issues. I think I solve this issue by creating a new project and add all the files and packages into it one by one. Check the XAML of the offending page carefully. I've had this error when I have ended up with a stray extra character which makes it invalid. i have the same problem with a project it worked with a older VS 2017 fine. I cleaned all obj folders and the solution.